Thank you to all the incredible presenters who contributed to the 8th Fire Gathering, 2015. Niibin Makwa, also known as Derek Nepinak, is a descendant of signatories to Treaty number 2 and 4 and is a member of the Pine Creek First Nation in Treaty 4 territory. He is currently serving his 2nd term as the Grand Chief of the Assembly of Manitoba Chiefs. 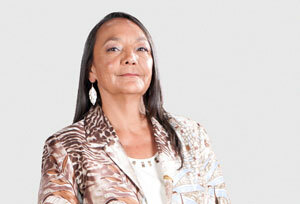 Tantoo Cardinal is one of the most renowned Aboriginal actresses in the world. Probably best known for her role as Blackshawl in Dances With Wolves, Ms. Cardinal has amassed a long list of awards for her work in theatre, television and film. She received best actress awards from the American Indian Film Festival, the Alberta Motion Picture Industry, and from international film festivals in Portugal and Zimbabwe for her role as Roseanne, in Anne Wheeler’s feature film Loyalties. Since then, Ms. Cardinal has received numerous awards for her work in film and theatre. She was also listed on the Maclean’s Magazine Honour Role in 1991, and received an Honorary Doctorate of Fine Arts from the University of Rochester in 1993. This quick listing of Ms. Cardinal’s resume doesn’t give a sense of her ability as an actress. She infuses her characters with warmth and honesty, and has had directors re-write roles if she felt they were a dishonest portrayal of Aboriginal people. Her strength stems from her upbringing in her Métis culture. Raised in Anzac, a rural town in northern Alberta, Ms. Cardinal had to move to Edmonton to finish her high school education. Her ability to overcome racist taunts and other hardships in the unfamiliar city became the basis of the confidence and charm that she now exudes on stage and screen. Beverley’s Mohawk name is Gowehgyuseh. It means; “She is visiting.” Her home community is Six Nations of the Grand River Territory in Southern Ontario. Bev practices law part-time and she is currently in her last year of an interdisciplinary PhD at the University of Calgary that includes Law, Indigenous Wholistic Health and Indigenous Research Methodologies. The title of Jacobs’ thesis is “Impacts of Industrial Development on the Wholistic Health of the Mohawk Peoples of Akwesasne: A Human Responsibility and Rights Solution”. Beverley is also a consultant/researcher/writer and most recently she is contracted to work with the Ending Violence Association of BC as its Indigenous Communities Project Consultant and with Awo Taan Women’s Shelter in Calgary. She has earned a Bachelor of Law Degree from the University of Windsor in 1994 and a Masters of Law Degree from the University of Saskatchewan in 2000. Jacobs has been a Professor at various educational institutions in Ontario, Saskatchewan and Alberta. She teaches courses on Indigenous Governance, Self-Determination, Canadian Indian policies, Canadian Law and Aboriginal People, First Nations Women and the Law, and Indigenous Law, just to name a few. She is also a sought after public speaker and has made numerous presentations across the globe on various issues affecting Indigenous people. She is a former President of the Native Women’s Association of Canada (2004-2009). Beverley has participated and made numerous interventions at various international fora and traveled to many communities, locally, regionally, nationally and internationally. She currently sits as a member of the National Aboriginal Advisory Council to the Corrections Services Canada and as a member of the Kekunwemku​nawak "Keeper of the Vision" at the Okimaw Ochi Healing Lodge in Saskatchewan. She is an Aboriginal Advisory Member to an international organization called Save The Children Canada and volunteers on many other committees. 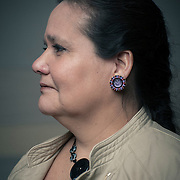 Amidst her impeccable professional portfolio is Amnesty International, a human rights organization that contracted Beverley to research, advise and write the first draft of the Stolen Sisters…, a sobering report, released in 2004, that brought international attention to the issue of missing and murdered Aboriginal women in Canada. In October 2008, Beverley was one of fifty women recognized by several Canadian peace organizations for her work and dedication to further a culture of peace in Canada. In November, 2008, she became a recipient of the Governor General’s Award in Commemoration of the Persons Case, in recognition of her contribution to the advancement of Aboriginal women’s equality. In May, 2010, she received a Circle of Honour Esquao Award from the Institute for the Advancement of Aboriginal Women in Edmonton, Alberta. Sylvia McAdam (Saysewahum) is from the Treaty 6 lands and is a direct descendant of Treaty people. She is nēhīyaw and nakawe and speaks fluently in nēhīyaw. Sylvia has her Juris doctorate from the University of Saskatchewan and a Human Justice degree from the University of Regina. 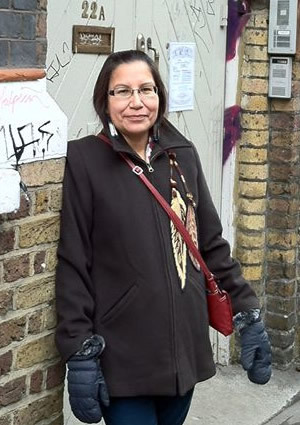 She is one of four first organizers for a global grassroots movement called ‘Idle No More’ in protection of Indigenous Sovereignty, Treaties, land and water. She has been selected for several awards namely; The Carol Gellar Human Rights Award, Foreign Policy Magazine Top 100 Global Thinkers Award, Social Justice Award, and 2014 Global Citizen Award. Sylvia’s most peaceful solace is when she is back home on the lands and waters of her people; always doing her best to protect the places in which our relatives are buried. Jesse Cardinal is a coordinator for Keepers of the Athabasca and grew up in the Kikino Metis Settlement in Alberta, where she still resides. Jesse left home to travel and go to school and now makes Kikino (‘our home’ in Cree) her home. Jesse grew up in a time of drinking water from ground wells, snow and streams. Berry picking and harvesting food from the land was a way of life as a child. As a coordinator with Keepers of the Athabasca, Jesse and others involved, work to unite the peoples of the Athabasca River and Lake Watershed to secure and protect water and watershed lands for ecological, social, cultural and community health and well being. Jesse has been involved in helping to organize the Tar Sands Healing Walk and has assisted in many Idle No More events. Keepers of the Athabasca often partners with other organizations and communities to tackle tough topics such as climate change, energy security, water protection, Indigenous rights and sustainable future. Her colleagues are a diverse group of people who come from all backgrounds - traditional, educational, and scientific - all concerned with the impacts that rapid oil/crude/tar extraction is having on the land, water, animals, plants and people, and working towards a renewable and more balanced future. Cheryl Watts is the President of Chief Executive Officer of Timely Trends, a leadership consulting company which shines as a luminary in her field, demonstrating expertise in organizational change, system thinking, complex competencies, public speaking, leadership writing, and women’s issues. She organizes speaking engagements, provides corporate/organizations leadership strategies that can foster change and a fun learning environment that engages people into the seminar, and provides readers with a clear understanding of the competencies she has learned and applies that knowledge in an easy format for all people to understand. Cheryl Watts was selected by Linda Ellis Eastman to write with her. Upon reflecting on her rewarding career, she attributes her success to her mother, who always highlighted what she can be. She became involved in her profession because she believes that businesses need to get back to the roots of respect and honesty. For many years of his life, rob has struggled with depression and suicide attempts. In 2001 he finally managed to work through the majority of his demons and successfully reconciled his marriage with his wife after three years of separation. In 2007 they moved their family off grid and now dedicate their lives to living a peaceful, balanced and harmonious life with themselves, their family, nature and the Creator. They work hard to learn the skills required to provide all the basic necessities of life as the Creator intended. In 2011 a well known film maker (Ben Stewart) released his third film UNGRIP on Youtube which highlighted the work that rob and his family has done over the years. rob has done many public and private speaking engagements over the past seven years, talking about sovereignty, the realities of our current political, economic and religious institutions. He has just released his first book called 'Graduating Life with Honours – Conscious Self Governance in God's Kingdom' which is free to anybody to download and read. It is an exploration of who we really are, our relationship with our self, each other and the Creator. The book highlights his journey towards living life in peace, freedom, prosperity and love. I was born and raised in Ontario without knowledge of my ancestry. Only in the early 1990s, as a Scout Leader at a Jamboree on Manitoulin Island did I become aware of the possibility that my ancestry is among the First Nations of Northeastern Québec. Last summer, I found my maternal grandmother’s record of birth, and soon I will be able to locate those of her parents. I completed a BA (2002) in Géographie physique and English literature at Laurentian University in Sudbury, Ontario. From there, I taught various courses in post-secondary education in Southwestern China for 10 non-consecutive years. I then completed graduate studies in education at OISE/UT (2009). During my graduate studies, I presented a paper on bridging formal and informal teachings and settings, thus demonstration the possibility that various education systems may be complementary (Guadalajara, Oct 2008). I recently moved to Hamilton, Ontario, where I began teaching at Collège Boréal. The subjects were Early Childhood Education psychology and Conversational French as a second language. In every course I have taught, I include aspects of a personal philosophy in order to support the students in their own journey.